The true blue Indian sports bike, the Pulsar has been the one that has brought performance biking on a budget to the Indian masses. When Bajaj brought out the Pulsar 200NS, the bike was something generations ahead of the rest of the Pulsars and now that bar is all set to be raised. The Bajaj Pulsar 375 which showed its front fascia a while ago has just posed again for the camera and good folks at Autocar India have been the ones to click it. 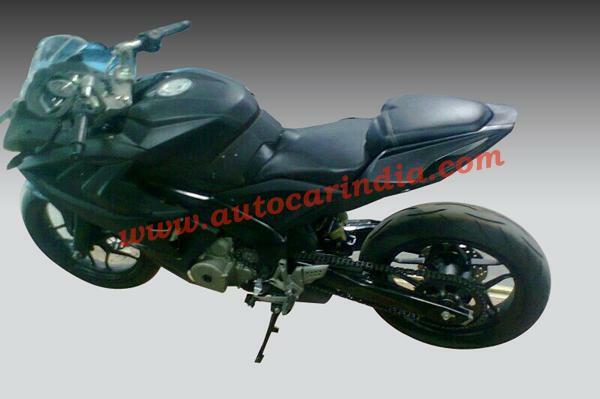 We’ve got more, clearer photos of what seems to be the upcoming Pulsar 375 from the good folks at Autocar India. As you’ll see from the shots below, the new bike looks pretty mean. At the front, the bike features a heavily sculpted fairing and a big brake disc. The body looks muscular due to the sculpted look which continues till the end. The leaked pictures showcase the full fairing of the bike and twin headlamps which lend a whole lot of character to the bike. It also features turn indicators which are eye like units. 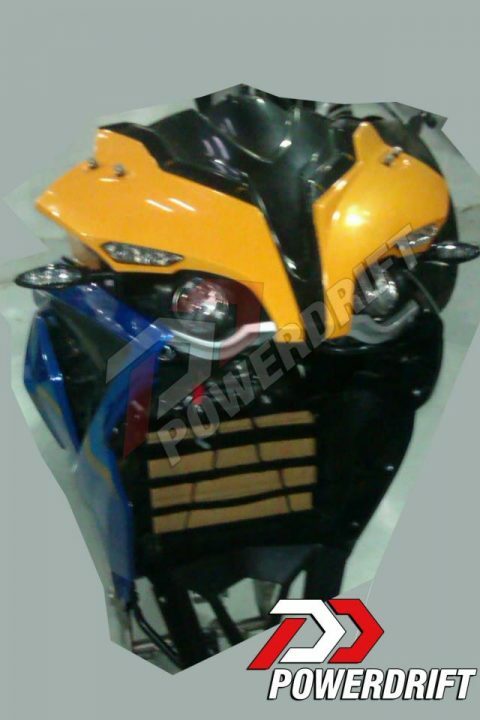 If you see the spyshots which had been leaked previously and these ones, the bike indeed looks quite similar to those. 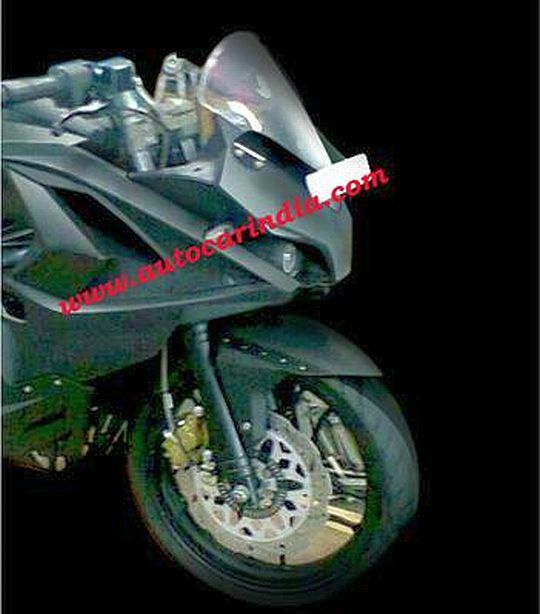 If all goes well and if these turn out to be the real pictures, we might just be having a look at the front of the Pulsar 375. 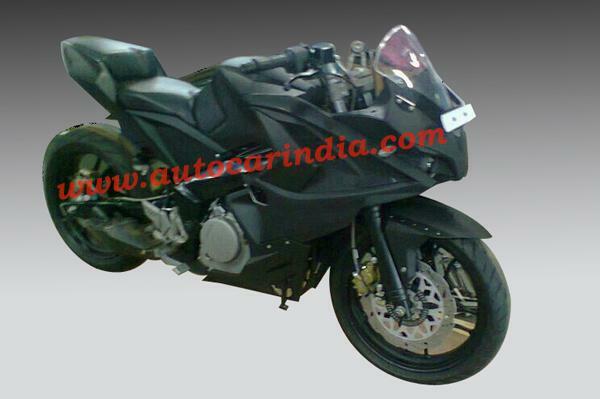 Bajaj Pulsar 375 would come with the telescopic front forks up front according to the spyshots. The Duke 390 uses USD forks but the Pulsar 375 would come at a price tag around Rs.40,000 lower than the Duke so it makes sense to replace the USD ones with the telescopic ones. The front tyre looks like a pretty beefy unit and so does the front disc brake. 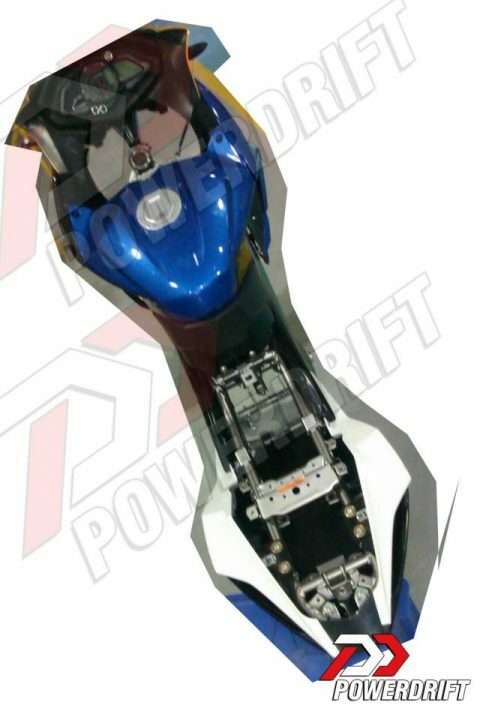 The bike will be putting out a power in the range of 40-44 BHP with the peak torque being in the range of 33-35Nm. The engine will be mated to a 6 speed manual gearbox. Bajaj Pulsar 375 will be brought forth with a pretty high level of localisation giving it a sub Rs.2 lakh price tag. Bajaj takes pride in bringing Value For Money sportsbikes to the Indians and the Pulsar 375 will be the flagship bike from Bajaj. We Indians love full faired sports bikes and the Pulsar 375 brings together a performance hungry engine, a full fairing and all that at an attractive price tag.